Here's another bit of poetry from Milwaukee's Delta Center I mentioned yesterday. This moved me especially because I live on a river. I wish I could say the fading light on the wall was planned, but it wasn't. The light fades, fades . . .
its centuries of dark thought. Crying at the convention center . . .
As a spouse of someone who attends two large conferences each year, I am lucky to be able to tag along when the city hosting the conference holds particular appeal. Two years ago I went to Charlotte, North Carolina, and fell in love with a city I'd never before visited. Last week, I piggy-backed on Hubby's trip to Milwaukee, Wisconsin, a city that I hold dear for many reasons, not the least of which is having raised my family there. Visiting a city that feels like an old, comfy friend gave rise to much nostalgia. But it also afforded me a new experience in the many years of attending conferences as a spouse--the opportunity to feel the locale through the voices of its writers and visual artists whose work is represented at the convention center itself. 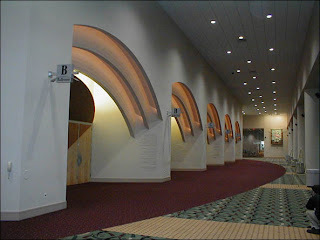 My tears freely flowed as I read the walls of the corridors in the vast convention center, known now as Delta Center. Snippets of work from fifty Wisconsin writers are mounted in bas-relief letters on the walls of the public hallways. I paused to read them as I came across them, and took a few pictures of some of my favorites . . . the ones that evoked either a sense of Wisconsin, or touched on the essence of life. I was especially moved by the poetry. It occurred to me that the building itself is worthy of museum designation--as the spirit of the place is deeply reflected throughout. Here is a sampling, a quote from John Muir (a Wisconsin native) that I loved. I found this prose as profound as poetry. I have typed it out below so you can actually read it. We've all seen extravagant kitchens, the kind with granite counter tops, stainless appliances, two sinks, an island, food waste repositories that all but march themselves to the garbage can or compost pile. I've done my share of ooh-ing and ah-ing over design elements, not to mention envying upscale details I would love to have in my plain, generic kitchen. Rarely, however, have I seen anything as charming as this newly erected shelf in my Canadian family's kitchen. I saw it for the first time this weekend. 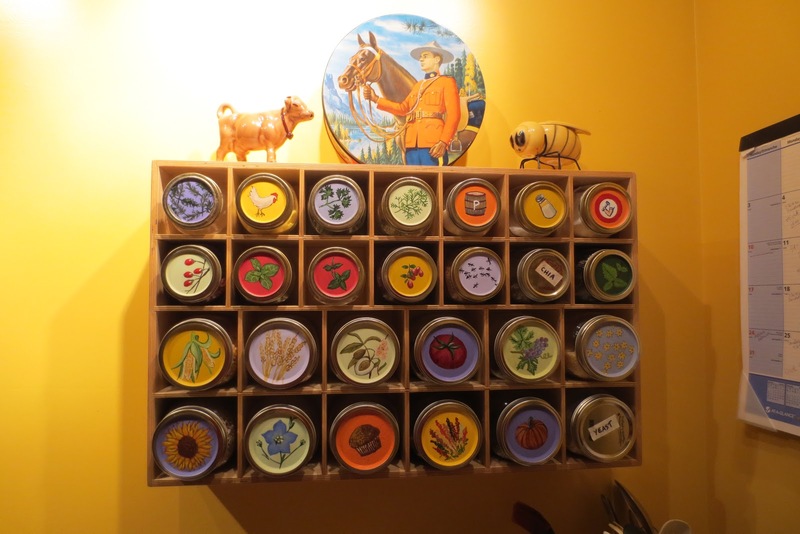 With its delicate balance between beautiful and practical, these spice and dry-ingredient holders are as appetizing to the eye as the smell of roasting potatoes is to the nose. 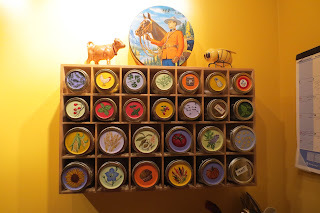 The shelf was custom made from baltic birch by my son; the mason-jar type containers were hand painted to reflect their individual ingredients by my daughter-in-law. You'll note that the artist is not quite finished with her project, but that only intensifies the personal statement this feature makes. I think you'll agree, kitchens can evoke beauty without extravagance. 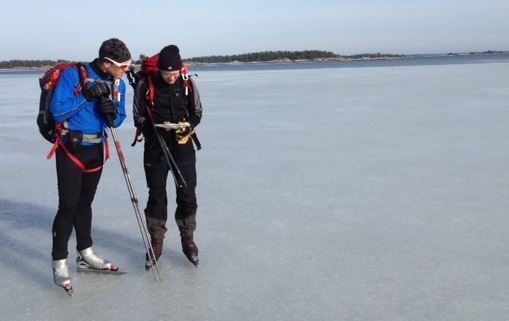 I read aloud Hans Brinker or the Silver Skates by Mary Mapes Dodge to my children when they were small, so imagine my delight when my daughter-in-law, C., sent this picture (via the Internet) depicting the skating adventure in Sweden that she and my oldest son are having. My son, M.. spent a lot of time in his late twenties and early thirties learning to speed skate and subsequently competed in races. Although he has long given up the racing, one item on his bucket list was to skate on a frozen river for days on end, just the way Hans did in the book. This he is doing right now, albeit in Sweden, not the Netherlands. But . . . when I saw his silver skates, I was absolutely tickled.